Compare Our Brick Ovens for Sale | NY Brick Oven Co.
Get to know a little 'bout everythin. Know whata meann? What else is there to think about? The most important investment you can make is your pizza oven! Get perfect pizza and an oven that pays for itself! Revolving pizza ovens can out-produce any standard brick oven 2 to 1. Based on the fact that the deck size is a 100% usable cooking surface and very easy to use. There are no hot spots on the floor that burn pizza and no cold spots. Just all production and consistency. Revolving pizza ovens can save you labor. The oven can be operated by one man simply and you don’t need skilled labor! The oven cooks the pizza perfect every time. This can save you tens of thousands of dollars per year and the oven pays for itself! Set the rotation speed and temperatures. You will make the perfect pizza with ease. Quality consistent products are vital to your success! Great pizza every time, low labor, happy customers: Priceless! You can’t cook next to the fire, so you lose cooking space; the front area is usually too cold to cook consistent pies on. The sides of the oven are hard to access and see how the pizza is cooking. In reality, you have a 40% reduction of usable floor space. You will have to depend upon your employee to cook your pizza perfect and you will need a very skilled employee all the time to rotate the pizza and make sure they don’t burn. Skilled labor = Higher payroll. Inconsistency, higher labor cost, more problems, burnt pizza, improperly cooked pizza, less satisfied customers! For what? To save a few thousand dollars? What’s your business really worth? To illustrate how much money you will save, we've put together this graph. 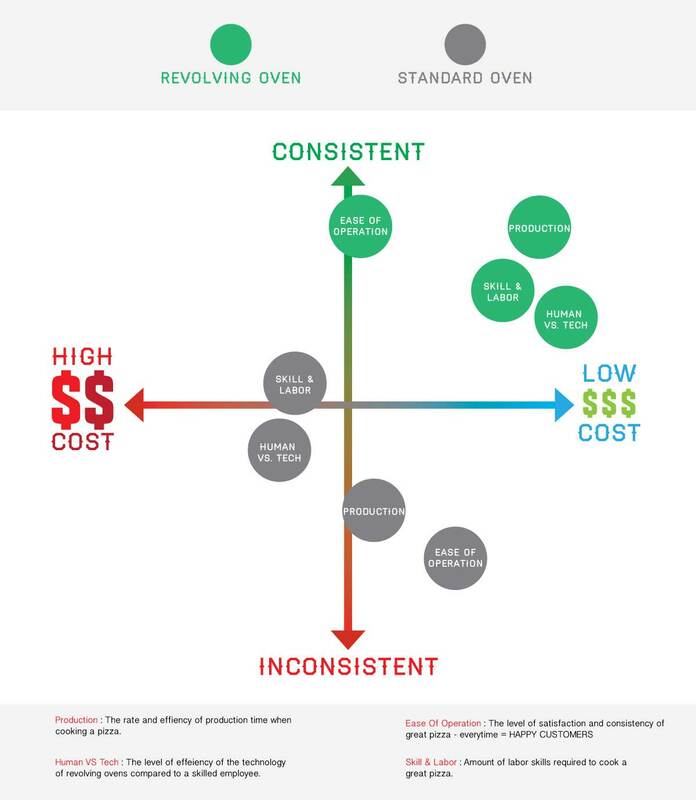 Why is it a "Smart" decision to finance our ovens? An oven that saves labor and produces perfect pizza is your best investment. If you save only 5 hours per day in labor cost annually, at $10 per hour, this equals $350 per week and $20,000 per year including payroll taxes. The oven pays for itself every month and still saves thousands in labor! So you can see from the above that the oven (just by cutting 5 hours of labor daily) will pay for itself in a little more than a year. That means profits can be higher every year after. With most brick pizza ovens you always need two skilled operators, always. Some stores have had up to a $40,000 per year savings after changing ovens based upon eliminating the person who has to rotate and cook the pizza. Or replacing two ovens with one. You can pay a lease payment monthly, or pay (and depend upon) an employee up to 5X the lease amount.